High quality pre-training shot, thanks to which every workout (even on a weaker day) you will perform on 100% of your abilities! Each serving provides a solid dose of stimulation and energy to operate. It contains such ingredients as: beta alanine, taurine, caffeine and choline. Bet on effectiveness and join the best! An amazing product with an innovative composition. His highly concentrated composition leaves no doubt. This time is no longer escape! Thanks to your workouts will become more intense and will bring much better results than ever before! The advanced formula based on the effective active ingredients! Looking for a unique product, which the potency of every quality of applied active substances is at the highest level? If so, consider just over the przedtreningówką. ON Platinum Pre is an excellent conditioner before training responsible for maximum muscle tension, and appropriate focus on training. Your workouts will become more intense, so they will bring much better results. If you are dealing with muscle tension, it is certainly not the kind of person you will experience using the product of Optimum Nutrition. The biggest advantage ON Pre Platinum is that all the components contained in the nutrient safe food, without causing any side effects. 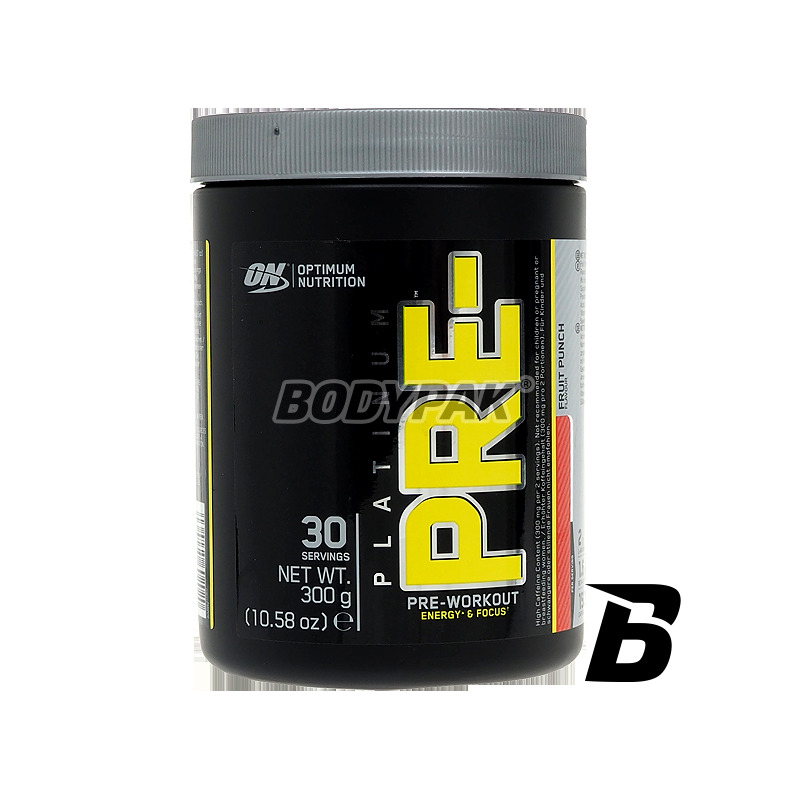 ON PLATINUM PRE- PROVIDES PROFESSIONAL SUPPORT in the pursuit of the coveted muscles! 1 serving 20 minutes before a workout. potassium chloride, CapsiMAX, ascorbic acid, salt, grape extract, emulsifier - lecithin bioflawanoidy citrus. Dobra przedtreningówka na początek, po paru dawkach trzeba zwiększyć do dwóch porcji, bo już tak dobrze nie działa, przynajmniej na mnie. Top-quality pre-workout product. Energy and increases the motivation to exercise. It contributes to the rapid growth of muscle tissue and strength! Bet on proven solutions! Perfectly formulated for use in training based on top-quality ingredients such as acetyl-1-carnitine hydrochloride, l-ornithine 1-aspartate, mineral complex and BCAA amino acids. The first such innovative amino acid preparation with the addition of red beet extract. Pharmaceutical quality! Sensational formulation that not only provides a solid agitation, but also increases thermogenesis support the burning of excessive body fat. The formula was based on the best ingredients, in suitable doses of supplements to bring the maximum possible benefits! Very high concentration - one pack is up to 50 full servings. High quality pre-workout directed at active women. Each serving provides as many as 10 active ingredients, which will make the training always 100%! Worth mentioning are solid doses of beta alanine, caffeine, l-carnitine, antioxidants and natural plant extracts. Put on proven solutions and enjoy the effects! UNS L-norvaline - 90 tabl.